Juice Direct is an ethical company which provides our customers with ready to drink juices, concentrates, pulps and frozen berries. 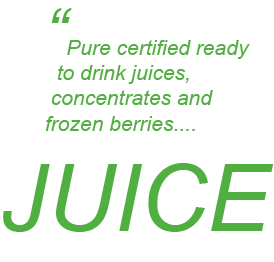 Our aim is to deliver our products to the highest quality and standard, and every juice in our range has its own certificate of analysis. All our juices comply with Government Regulations on Sugar Levels. We serve customers in the Greater Cape Town area from our established factory and distribution centre in Kuils River. We cater for Businesses with Multiple Outlets, Franchises, and Owner Operated Hotels, Guest Houses, Restaurants, Cafes, Bars, Food Manufacturers, Events Companies and Catering Companies. We are also an approved supplier to several food companies who supply Woolworths. Our Staff have worked in the industry for many years, and the business is expanding to meet the needs of our ever growing customer base. We deliver in our fleet of modern vehicles, and pride ourselves that orders placed before 10:00am will be delivered the same day. Orders can be made by phone, email or fax. We have an after-hours answering service, so that you can place your order requirements for next day delivery. Cash and carry customers are welcome to visit our factory shop in Saxenburg Business Park in Kuils River during normal working hours.